Early on a bright autumn morning Marcus Varischetti hacks away at an enormous, half-buried tree root. Moments later, he enlists a small army of helpers and after a few minutes of heaving and sweating they remove the stubborn obstacle. Varischetti, 20, is a Noongar man who grew up in Rockingham and now lives in nearby Kwinana. The root is from a Japanese pepper tree that grew in a garden bed at the City of Kwinana administration centre and is now resting in a wheelbarrow. Varischetti is taking part in a Certificate II horticulture course run by Central TAFE, with the Wirrpanda Foundation and the City of Kwinana. The course runs for 32 weeks and teaches participants about weed eradication, soil properties, plant pests and diseases, sustainability and general gardening and landscaping principles. 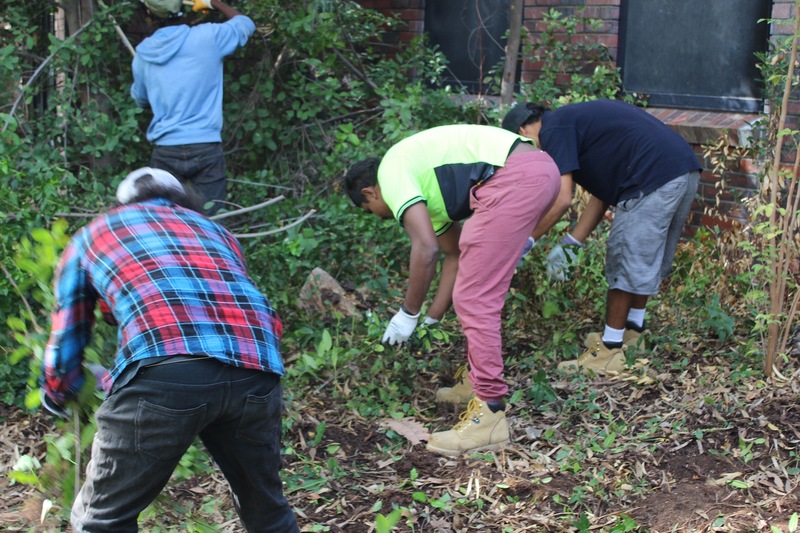 As part of the course, students have been cleaning up the gardens at the Medina Aboriginal Cultural Group centre and have been removing weeds from and revegetating Kwinana’s threatened bushland areas. The Wirrpanda Foundation operates mentoring programs throughout Australia that help Aboriginal people with their education, life choices and entry into the workforce. Recent statistics have Kwinana’s unemployment at 11.8 per cent, more than double the Western Australian average of 4.6 per cent. City of Kwinana Mayor Carol Adams says unemployment has long been an issue for Aboriginal people in Kwinana. “However the horticulture course is an excellent program and will assist participants to gain qualifications that should help them gain employment,” Adams says. “Full-time work can be hard to find, but I go hard at it,” Varischetti says. One gets the feeling Varischetti goes hard at pretty much everything he puts his mind to. He encourages fellow students to join in and improve their learning. “Having a go, making the most of it – that’s what it’s all about,” he says. “It’s not just me, we all help each other. “But first you just need an opportunity”. Paul, Sydney and Marcus cleaning up the City of Kwinana’s garden beds. And that, according to Varischetti, is what many Australians don’t understand about unemployed people. “We’re not bludgers,” he says. “We don’t want to be on the dole. Varischetti says the course gives the students more than just horticultural skills. “It gives us a sense of pride and self respect,” he says. Horticulture lecturer Paul Clarke says Varischetti’s willingness to learn will see him get real results from the course. “I’m just so pleased to be able to give young blokes like Marcus something to focus their energy on,” he says. “And it’s not just Marcus, all the guys are so keen to develop new skills – it’s a pleasure to teach them. “It’s amazing how much they encourage one another. Many of the course’s participants are good friends. Wirrpanda Foundation CEO Lisa Cunningham says she is thrilled with the program’s results. “It’s such a success we will now be using Kwinana as a model for our future programs,” Cunningham says. “There’s a real benefit to having an all-Aboriginal learning environment. “The participants genuinely want to help each other succeed. Last week Varischetti was offered an eight-week trial position at a local wholesale nursery. He will work one day a week, while still being able to complete his horticulture certificate. Despite his recent success, Varischetti says he had a more difficult childhood than most people. “I was homeless at one point, until my Nan rescued me,” he says. “She came and got me one day and I’ve been living with her ever since. ‘Nanna Jean’ Varischetti says she is thankful for the opportunities the Wirrpanda Foundation has given her grandson. “He just really needed something to get his teeth into, something to wake up for in the morning,” she says. “I know he’ll do well, he’s such a wonderful boy. “The whole neighbourhood loves him. Revegetating the dunes at Kwinana Beach. Jean Varischetti says her grandson never has a bad word to say about anybody. “Despite all the hardship he’s faced, he’s got such a positive attitude,” she says. Marcus Varischetti’s recent problems finding a job highlight how damaging it can be for young Aboriginal people. Last year he worked a trial shift for a deckhand position in the Cockburn shipbuilding centre of Henderson but was told he had a bad attitude and was unsuitable for the job. “I couldn’t understand it,” Varischetti says. “He said I wasn’t looking him in the eye. “But I was really enthusiastic and respectful, really keen. Whatever wires were crossed that day, it had a powerful effect on Varischetti. “It really put me down,” he says. “I had just turned my life around and I was doing really well. “I’d learnt how to deal with all the bad stuff that happened to me in the past and was moving on. “I tried really hard to get this job and then to be told I have a bad attitude – I just couldn’t understand it. But Varischetti is not one to keep his head down for long. “I came home and told my Nan,” he says. She told me to keep my head high and not to worry about it too much. “To me, being Aboriginal means being strong, and that’s what you’ve got to be. Cunningham says this kind of story is a familiar one. “A lot of Noongar people don’t look people directly in the eye but it’s not a sign of disrespect,” she says. the consequences can be devastating for some people, which is why these programs are so important. “They’re out doing real jobs and helping their community. Soon after the setback, Centrelink informed Varischetti about the course. Victor Hansen, centre, talks bush tucker. Varischetti says it was just what he needed. “Rather than feeling like I’d failed, I had a chance to improve my situation,” he says. “Doing this certificate has really helped my confidence. Participating students gain traditional Noongar botanical knowledge. Varischetti says learning about traditional Aboriginal culture makes him feel proud and brings the group together. “Some of guys in the group know a lot about traditional culture and it’s great being able to learn from them,” he says. “Take Victor, for instance, when he starts telling us about the old ways – everyone shuts up and listens. “It brings us together as a group and puts everyone in a positive frame of mind. Victor Hansen, a participant in the course, is 26 years old but commands the respect of someone far beyond his years. Hansen grew up in Perth, but he is a Badimia man. About 600km northeast of Perth, Badimia country is located around Mt Magnet is the state’s Midwest. Mount Magnet is one of WA’s oldest gold mining towns, and mining operations continue to expand in Badimia country. As a member of the Badimia Working Group, Hansen helps negotiate with mining companies on behalf of his people. “A lot of our sacred sites are under threat from new mining developments,” he says. “So we sit down, we bring them to the table and we negotiate with them. Hansen says he is honoured to represent his people. 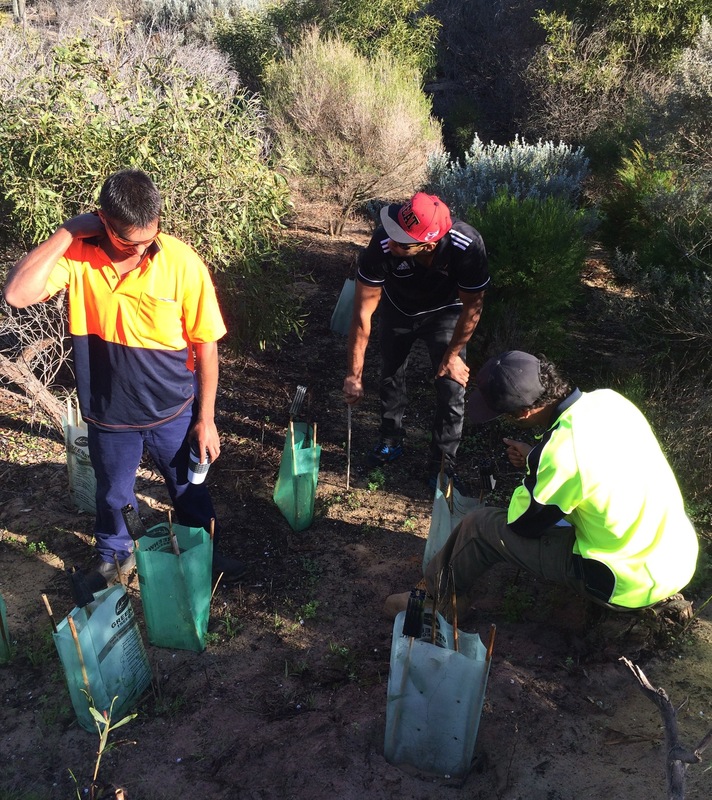 The participants take it in turns to remove the last of the Japanese pepper trees. “In a way I feel very proud, but then there’s the part of me that feels sad,” he says. “We’re giving away some of our sacred sites. “Sometimes we’ll be sitting with the Elders and they’ll get teary eyed just talking about these places. The fate of his people’s culture rests partly on Hansen’s shoulders. It is an awesome responsibility for someone in his twenties. Although he grew up in Perth, he has been ‘going out bush’ in his family’s country for years, being taught traditional Badimia knowledge. Hansen says it’s important for young Aboriginal people to learn about their culture. “It’s good to be proud of who you are,” he says. “But a lot of young blokes, they wouldn’t even know how to skin a kangaroo. Hansen’s knowledge includes animal tracking, bush medicine, navigation and finding food and water. Whether he is explaining how to find emu eggs or talking about the customs of his people, he always has a keen audience in his fellow students. “I probably know a lot more about these things than the other guys, so it’s nice to be able to teach them a little bit of it,” Hansen says.